As for my booking, I shall wait till they allow me an exhaustive TD before I finalise. I am not impressed by the practicality offered by the 300, and I am not one who is easily taken in by dhinchak chamak wow-wow features. The whole over-selling of the features and singing praises of the fully loaded variant over the past 2 months, tie-ups with multiple auto-media channels etc... one gets the feeling that the company is trying to over-compensate for an 'optimistic' price tag. I cannot recall M&M taking so long to announce prices, rather one is used to a very attractive introductory price tag thus stealing the limelight. Perhaps I am wrong but a few more days and one shall find out. As per the below W6 walk-around it's also having black seat covers.. I think,only the W8(O) will have white seat covers. It's not W6. At 1:42 in this video, we can see the W8 badging. Rear seat belt reminders are missing and front parking sensors too. Black fabric seats look premium though. I liked them more than the leatherette cream color which will be a dirt magnet. Last edited by Gannu_1 : 11th February 2019 at 21:33. Reason: Removing youtube URL from quoted post (repetition). The other possibility is that they have only garnered 4000 bookings so far as per media reports - so a bit of panic setting in? Anyways, i really hope they price it sensibly. Being poor on practicality, utility is a deal breaker for many indian families, so a hefty price tag can sink this to the bottom of indian ocean in the blink of an eye. Autocar breaks Limca book of records with XUV300 in Rann of Kutch. The video is well made but it seems to be sponsored by Mahindra though I could be wrong here. 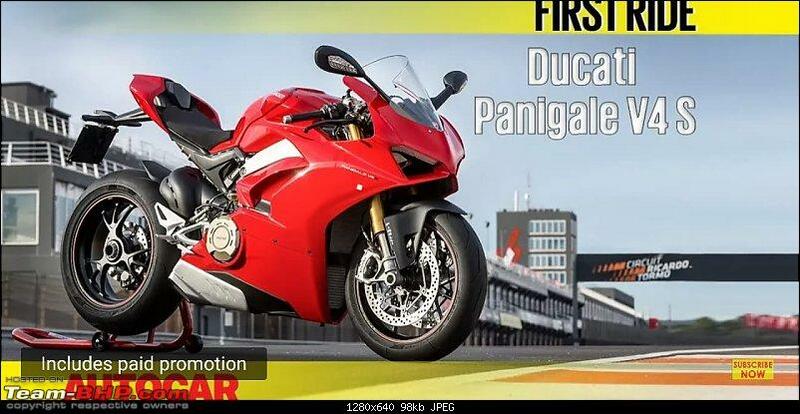 Interestingly another video from car and bike. Didn't get the objective of the video. Are they saying, that say the TATA Tiago JTP would not be able to break this time mark from a lower segment or, that the Creta and EcoSport or Honda City too would be slower? Regarding the ACI video, well, they are just attempting something which has not been done by anyone and conveniently passing it as "setting a record" (technically they are!). But once people see through the whole brouhaha, the joke will be on ACI and Mahindra. Mahindra teased and advertised TUV 300 also similarly, but not aggressively as done in XUV 300. Rather than from compensating to an optimistic price tag and to the practicality issues as discussed, I feel that Mahindra is doing all the good things they can do to give XUV 300 high revs. This is a very important product for Mahindra and the competitors are strong. When the Nexon is advertised strong and progressively by Tata, why should Mahindra launch such an optimistic car the normal way? Heated ORVM - Will it be useful in India? A rear AC will be more useful, for our hot climate with very short Winters. Barring north east and places at the foot of Himalayas, rest of India is hot and humid. Heating might be useful even in rainy season too, but overall the utility might not be useful in general. The feature is definitely good, but not a deal breaker. Heated ORVM - Will it be useful in India? Definitely not a segment first. My 2009 Fabia has it. Living down south I have used it hardly once or twice, only to check if it works. Maybe helpful in hill stations. True, but they also have a history of overpricing their Ssanyong products like the previous generation and current generation Rexton. Hope that's not the case here! 4000 is a good number, specially since XUV 3OO came out of the blue for most Indians, who don't follow forums etc to know about the Tivoli. Not to mention the on-road prices being revealed as of now is much above segment prices. I was informed 15L onroad in Bangalore. In comparison, TATA Nexon which was known for more than 1.5 years before launch (Unveiled Feb 2016, launched Sep 2017) managed to reach the 10k figure only after 1 month of launch IIRC. Segment = Vitara Brezza / TATA Nexon / Ford Ecosport / Honda WR-V / Mahindra TUV3OO, the sub-4m crossovers. Last edited by CrAzY dRiVeR : 12th February 2019 at 09:33. Rear AC & ORVM are entirely different and useful things. Down south, it may not be very important but up north and in east, where it rains a lot and has very low temperature, one needs that, else you can't do much, either wipe it it, resulting in smudging it [unless you get off the car & thoroughly clean it, maybe in pouring rain]. I had used it in the Yeti and found it useful. Mahindra has now made sponsored videos with many, many auto magazines and video channels. Now I really cannot help but wonder how these media houses will produce unbiased reviews of the XUV3OO. Team-bhp has gotta be the only option for us. Does anyone know when deliveries will start? This does look like a smart purchase in the segment and once the product gets established I think it will bring in sufficient volumes for Mahindra. I understand that one way of monetizing your YouTube content is to make paid videos though you have to be up front with Youtube and ensure it is disclosed when you upload your videos. I believe, and I could be wrong, that this disclaimer only comes up the first time you view the video on YouTube. 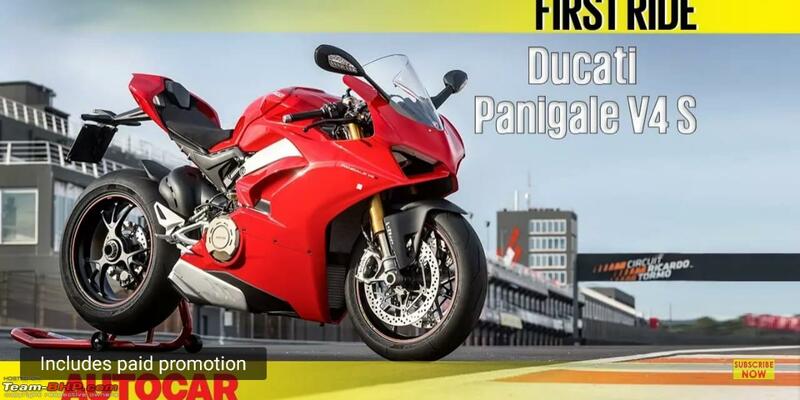 On the topic of promotional videos with reputed magazines, I had noticed that the first ride video of the Ducati Panigale V4S by AutoCar India includes a YouTube disclaimer that the video includes paid content. The above photo is one that I had taken a few months ago and I was quite honestly surprised to find it. I don't see a similar disclaimer for the Mahindra video. Im not saying Mahindra may or may not have paid for some of it, Im just saying YouTube doesn't tell me the same one way or the other. I'll leave it to you to make an informed choice. Checked out the XUV300 on display at a Mahindra showroom. - White seats are going to be a big headache to maintain if you are a cleanliness freak. They are a stain magnet! The display car already had stains on both the front seats. - I could feel that the silver finish on the steering mounted audio control might get faded over a period of time especially of the frequently used buttons such as Volume +, - and mute. However, its too early to say this. Only time will tell. - Exterior built quality felt really good. Appears to be a solid car. - Looks wise, the car will not make you go wow like the Ecosport or the Nexon. Drivability might, if we go by the reviews. - Its clear that many are not happy with the boot space. 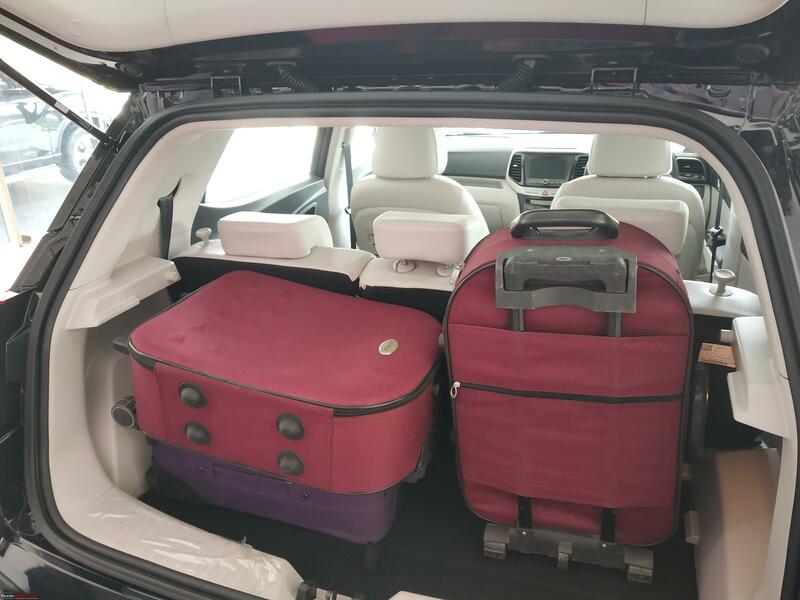 Hence, the display car already had three empty suitcases in the boot of the display car. Again, these were small suitcases only. 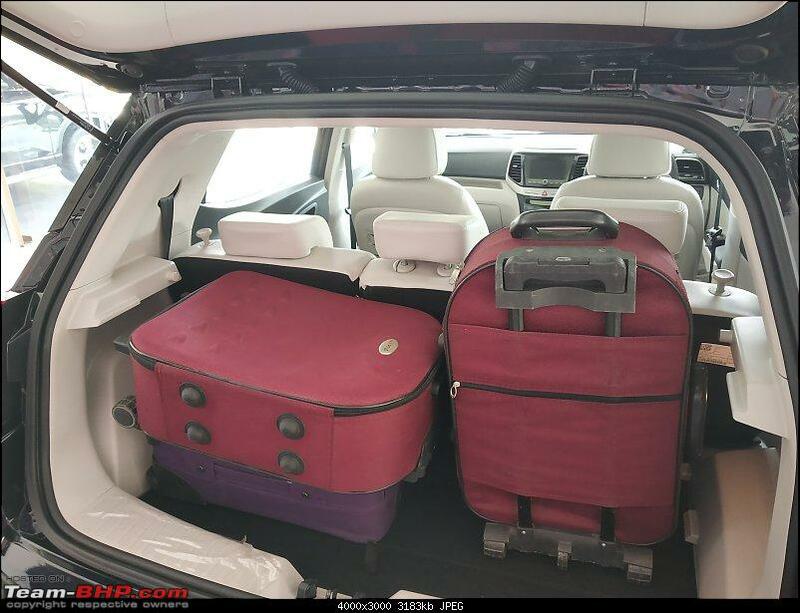 From the pic, we can observe that even if we need to keep any two out of the three suitcases shown, we will have to remove the parcel tray to make space. So the boot is big but only at disappointment. Last edited by Sherlocked : 12th February 2019 at 12:06. I was ready to book but then I saw the boot . The xuv 3OO can be used for city purposes only. You cannot carry luggage for the weekend trip for the family. I was thinking that my search for an SUV has ended when it was announced but after seeing in person, it has started again. I am also in the hunt and had zeroed in on XUV 300 as a potential buy. What other options are you looking at?